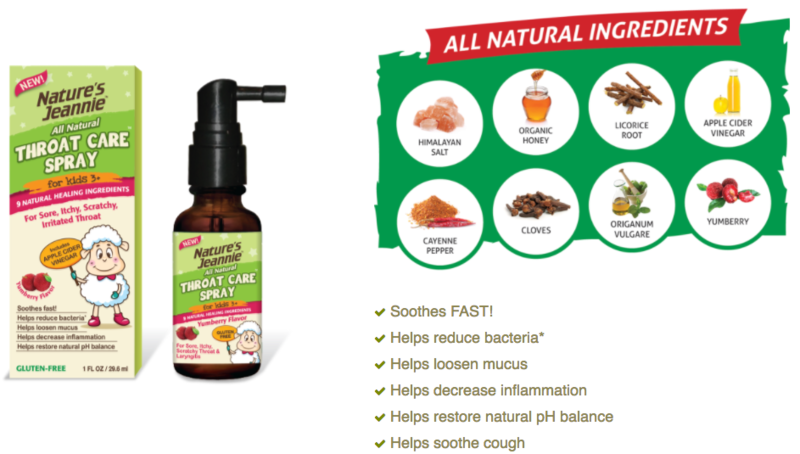 Nature’s Jeannie® All Natural Throat Care Spray for Kids: Ingredients Highlight! Salt from the Himalayan Mountains is superior to your regular table salt, and actually even better than many sea salts. It’s purer, since it’s not as exposed to pollution. It also has many health benefits. Himalayan salt contains 84 minerals and electrolytes found in the human body. It’s said to control water levels, stabilize blood sugar, reduce cramps and aid with digestion. Organic honey is different than the honey you find in the bear shaped container at the grocery store. To be considered organic, the honey goes through a complicated vetting process that tracks everything from the flowers used and the bees’ foraging area to the extracting process and packaging materials. Organic honey is minimally processed and can’t be heated above 95 degrees, or warmer than the natural temperature of the beehive. While most store-bought honey is nothing more than a sweetener, organic honey has real health benefits. Organic honey has antibacterial properties that can fight off illnesses and assist with digestion. It can also be used to treat acne-prone skin. It also contains antioxidants that fight free radicals and reduce bad cholesterol levels. Plus, when used in tea, organic honey can ease sore throats. Licorice root might be among the highest overlooked of all natural treatments. The key therapeutic compound, glycyrrhizin (which is 50 times sweeter than sugar) employs numerous beneficial effects on the body, making the licorice a valuable herb for treating a host of conditions. It is known to be useful for several conditions including asthma, chronic exhaustion, melancholy, coughs, heartburn, viral infections, fungal infections, ulcers, liver troubles, menopause and sore throat just to name a few. While licorice root has many beneficial properties, be careful not to take too much of it. It’s recommended to talk to your primary care physician to go over any potential problems that licorice root might cause. Apple cider vinegar has multiple effects on your body. First, it helps promote weight loss. While it’s not a magic potion, consuming apple cider vinegar daily can help boost your metabolism, assisting with weight loss. It also regulates blood sugar and lowers your cholesterol, lowering your risk of diabetes and heart disease. It even helps kill bacteria to aid with digestion and may even shrink tumors. Cayenne pepper, even just the powder, does a lot for your body. First, it can really help you if you’re sick. It can ease sore throats and coughs, break up congestion, and relieve joint and migraine pains. Cayenne aids with digestion and detoxifies your body, since consuming it increases our lymphatic and digestive systems. It is often used to promote weight loss. Many people drink warm water with lemon, cayenne and honey in the morning to detox and jump-start their metabolism for the day. Cloves are a delicious spice used in cooking everything from savory meals to desserts. It’s a popular ingredient in holiday favorites like pumpkin pie and gingerbread, but also tastes good in soups and chili. Cloves are a natural painkiller and fight germs, so using them in tea can help ease a sore throat. They also have anti-inflammatory properties, so can help ease an inflamed throat or on sore muscles. Origanum vulgare, also known as oregano, is a popular herb commonly used to flavor food or brew tea. It has a wealth of health benefits such as its ability to protect the immune system, prevent the onset of chronic disease, improve digestion, detoxify the body, strengthen the bones, improve heart health, increase energy levels, and even protect against diabetes. The yumberry or yang mei from China has vitamin C, thiamine, riboflavin and carotenoids. They look a little bit like a raspberry with a sweet-sour flavor similar to a cranberry or pomegranate. This superfruit is known to fight free radicals, reduce your blood pressure, protect your heart health, lower cholesterol, protect your eyesight and reduce your risk of cataracts, strengthen your cell membranes and fight inflammation and associated diseases such as arthritis. All of those ingredients are perfect for helping ward off illnesses, but they’re also great to use if you do get sick. Thankfully, Nature’s Jeannie® All Natural Throat Care Spray for Kids contains all of them to help ease your little one’s sore throats, naturally.